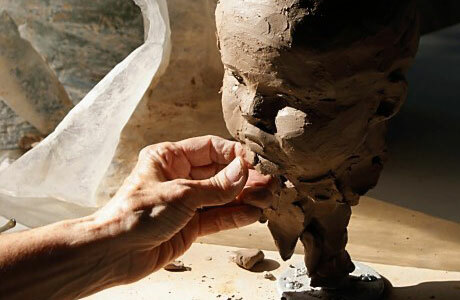 Deborah Luke’s journey as a sculptor began in 1971 at Dominican College in New Orleans. There she studied with noted Louisiana sculptor Angela Gregory who studied under Antoine Bourdelle, considered one of the informative speech topics for college most accomplished students of Auguste Rodin. Forty years later, Luke’s work can be found in private homes, hospitals, schools and churches from California to North Carolina, and many states in between. Since 1996, her work has centered on the life and passion of Christ with occasional returns to her first love in sculpture, the portrait. She welcomes the challenge of working with clients large and small, bringing to life works inspired by holy scripture and informed by the needs of worshiping communities. I cannot remember a time when I did not derive great joy from art. Drawing came first. Faces were my passion for a long time. In college, I discovered the third dimension. Modeling in clay, casting in plaster, carving in stone, I lost myself and found myself at once. Hypnotized by the play of light on the surface of wet clay or the sound of the sculptor’s mallet striking the steel chisel, I found my pearl of great price. Or, did it find me? We play an elusive game, the pearl and I. Seeking and finding each other at moments expected and unexpected. Standing before the Pieta in St. Peter’s, eyes opened; sitting in the silence of my studio, eyes closed. My eyes were closed when I saw the dove descending. I seem to be drawn now to that which is unseen, by that which is unseen. To the divine? I seek to find the answer with my hands, and trust that they are held by a loving God, whose unseen face has me under His spell.